It is DONE! I even have a hanging sleeve on the quilt and a label (something that seldom happens until needed). 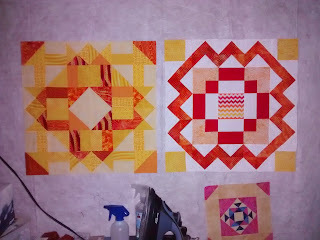 When presented with May's A Focus through the Prism challenge, the Monkey Wrench block gave me too may design choices. It may be simple block, but that makes it easier to manipulate and go wild with ideas. Playing with EQ7, I tried many different designs. This one won out because of the interesting cross that happened in the middle. I chose to make it scrappy with a consistent background. I pulled a very light yellow for the background and several yellows and oranges (with yellow in the prints) and set to work. The first obstacle came with the fact that I used a 3X3 block in a 10" size. I should have used the 5X5 so I could use a better measurement for my units. Three and 1/3" units within the block means I had to guesstimate a bit to make things fit. For some reason the manufacturers of my rulers ignored that measurement! Once the top was pieced, I realized that the quilting could draw the quilt up too much and then my quilt would be too small. A small border was added so I could quilt to my heart's content. The top now called for quilting. How to quilt the top? I chose a traditional quilting design with feathers around the center squares of the blocks. This picture shows the back of the quilt before I sewed on the sleeve and label. This choice fit the traditional design of the blocks, but seemed rather bland. That is when the monkey came in to play. I took a silhouette of a monkey hanging from a branch, transferred it to the quilt top and used a faux trapunto technique to make him stand out from the background. To push the trapuntoed design further forward, I used a McTavishing inspired design for the rest of the piece. The quilt has no binding, I used a facing so that the border becomes a faux binding. 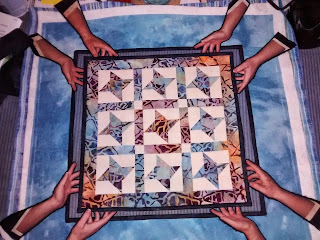 If you would like to see how other quilters interpreted the challenge, check out Persimon Dreams. I have finished the quilting, and have blocked the quilt. Here it is, drying while blocked. 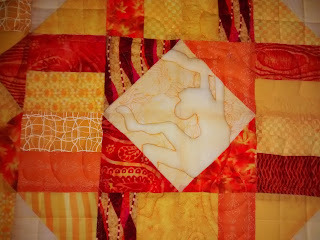 The quilting includes a trapunto monkey in the middle - maybe I should call it Monkey in the Middle? What do you think? Today I plan to finish it off. I think I will try facing the quilt rather than binding it. The border will be trimmed WAY down and will end up looking like binding if I face it (I think). This quilt is for the A Focus through the Prism Challenge, an offseason Project Quilting challenge from Persimon Dreams blog. I thought it was interesting how well the challenge piece and the round robin coordinate. Maybe the round robin spoke to me so quickly because I was already working with the same colors. I just know that usually I don't work with the yellows and oranges, so it surprised me to hear the center block tell me so clearly what it wanted the first round to be! I'm out of school, the busy weeks are starting to fade, and I have something on my design wall!!! The yellow block is the start of a quilt for the Project Quilting off-season Focus through the Prism Challenge :) The other block is an oldie I ran across recently and may develop into something. What is on your design wall? Check out more design wall links at Patchwork Times. I finished my challenge quilt in time :) The binding was done at 1 AM and I turned it in by 8:30 - whew! I have an image of hands (my own photo), edited out the background and printed it onto batiks (two different ones were used for subtle differences). 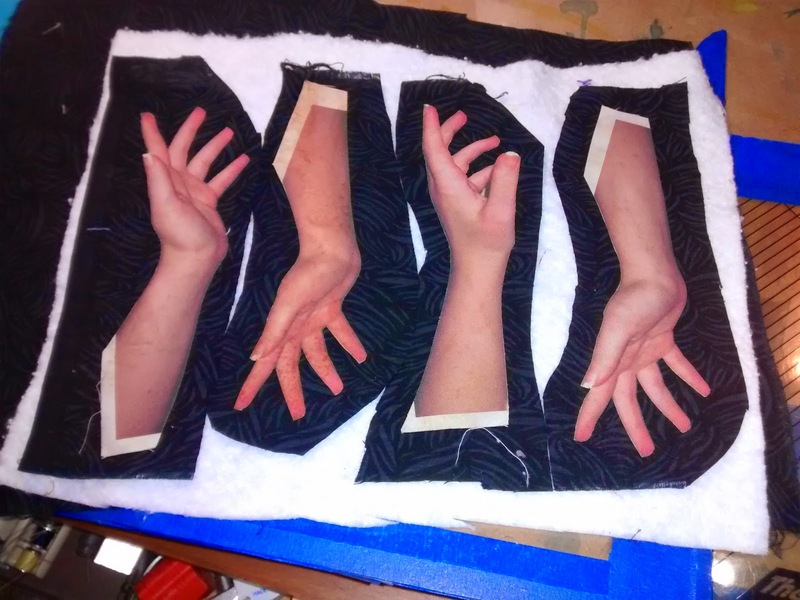 I fused the hands to black fabric, stitched them down and added a little bit of quilting. 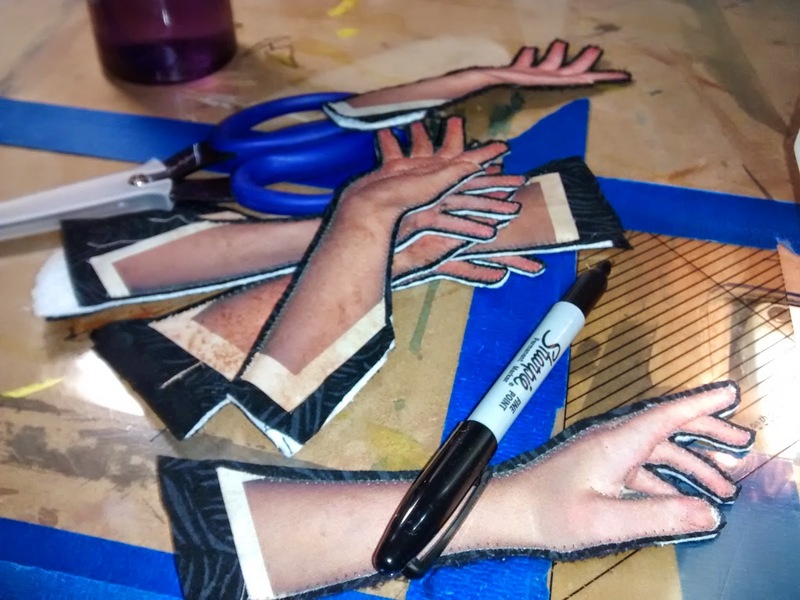 The hands were cut out and I ran a black Sharpie over the batting that showed around the edges (it was distracting!). 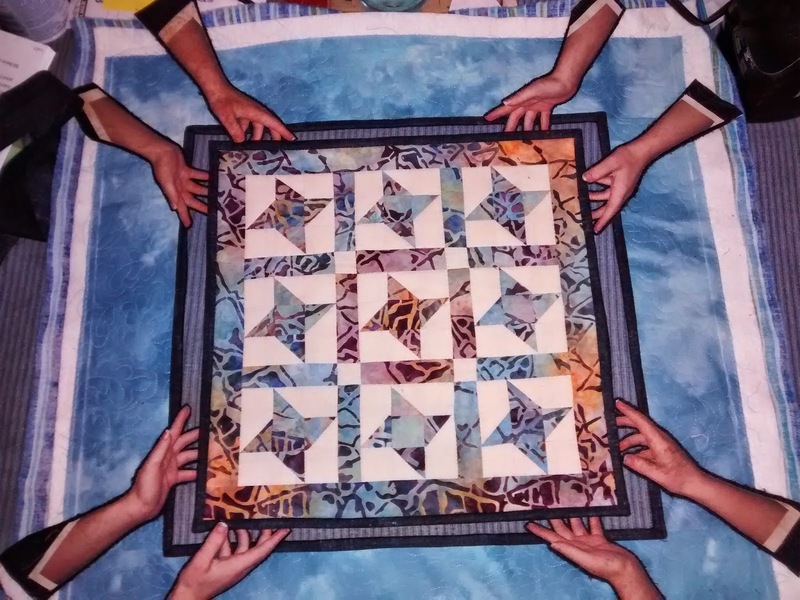 I played with the arrangement of the hands and center quilt until I was happy with the results. The totally on-point version did not look good (hence, no picture) and the straight on was OK (above), but this slightly skewed version is EXACTLY what my vision wanted to portray. 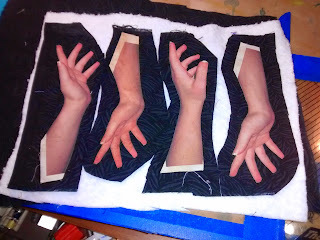 The quilt was bound with another thin dark binding and I sewed the fingers to the quilt (see the pins?). The hands/fingers are the bridging element ... they bring the whole design together. Our guild challenge was to make a 20"X20" quilt, using a specified fabric (the batik in the stars, sashing and border of step one), using at least one Friendship Star block, with the theme of Threads of Friendship. I have step one done - the small quilt in the center; pieced, quilted and bound. Do you think I will have it done for turning in tomorrow morning by 9 am??? ?